What a cathartic experience to be out in the good, cold air, digging, planting and planning. Although festering by the fire is a joy, it felt good to venture out and start the new growing season with a vengeance. The sun was shining, and, yes, the birds were singing - there was a robin very close to me, in an elder tree, and it hardly stopped the whole time I was out. The rooks were flying overhead, cawing as they flew, and although it is a melancholy sound, it is a something I love to hear. The local sparrowhawk must have been high in the sky because all the birds suddenly took flight at one point, including my fantail doves. I couldn't see it, but they clearly could. Later, I did find a sad little mound of white feathers, and part of a wing, down the garden, so one of my fantails had not been quick enough to escape. Over the past year, I have become increasingly obsessed with roses, and as I said in my last post ( 'New years Resolutions - grow more roses. And repeat' ), this started with David Austin English roses and is now extending to Old roses. I received a couple of books for Christmas, so have spent time going through and choosing 3 Old roses to start me off. I chose 'Comte de Chambord', 'Mme Alfred Carriere' and 'Mme Isaac Periere' and I ordered bare roots about ten days ago. When they arrived, I was unable to plant them immediately, so I pierced the plastic covering the roots, and put them in a bucket of water for a couple of days. I knew exactly where I wanted to plant them, so I had to move some less exciting plants to make room, just some elderly Michaelmas daisies and some grasses, which would benefit from splitting/ moving anyway. This hole was still not big enough - those roots need room to spread out ! 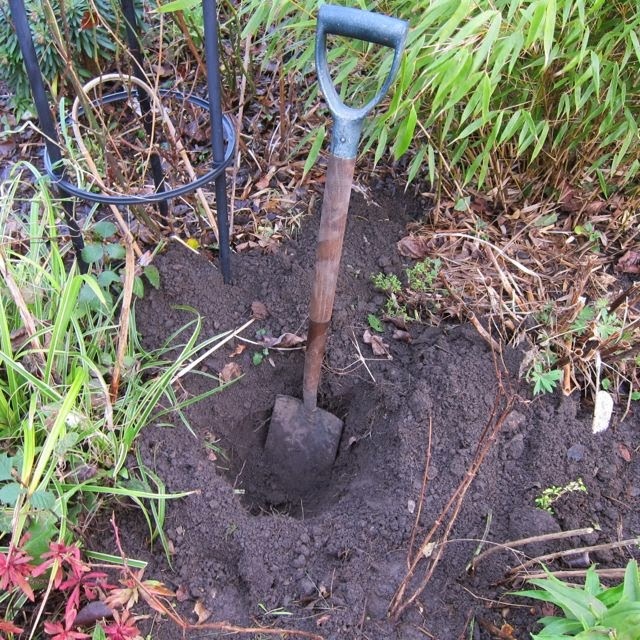 I also dug the surrounding area so that the roots could grow easily into nice loose soil. 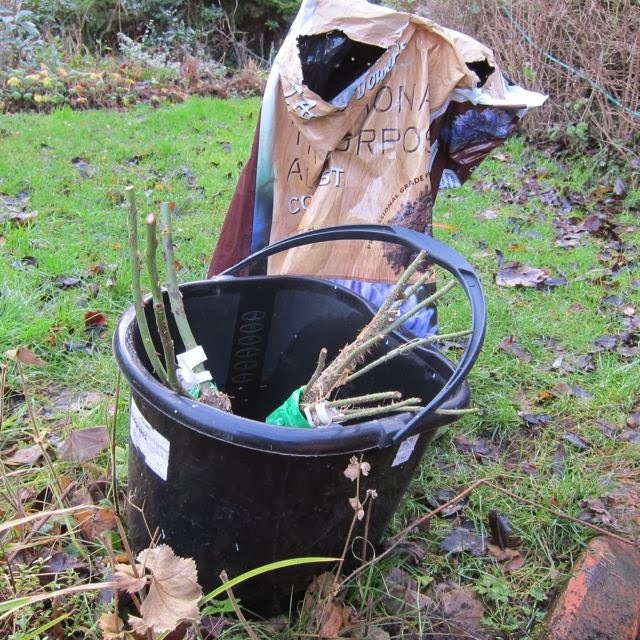 The roses were planted generously, in compost, mixed with a specific rose fertiliser. This specified 29 grams per rose, but as I hadn't taken my digital scales out with me (!) I'm afraid I just mixed in about three slack handfuls, and hoped for the best. I will also top dress with well-rotted horse manure in March. Now, I hope this isn't just me, but sometimes, when I've forgotten the right tool for the job, I just can't be bothered to go back and get it, so I grab the nearest thing to hand, and it takes me five times as long to complete ! Because I forgot my little knife, I grabbed these topiary shears, then had to cut open the rose packaging with them. Believe me, it would have been a whole lot quicker and simpler to make that trip to the greenhouse for my forgotten knife ! This is 'Comte de Chambord' ready to plant, and it had a good soaking beforehand. It was well packaged with spaghnum moss around its roots to protect, and to maintain moisture. The plants were good, strong and healthy looking, with good root systems. 'Comte de Chambord' is a pink, repeat flowering Portland rose, bred by Moreau - Robert in 1863. It is recommended by David Austin, and is said to be tough, reliable and trouble free. Its size is given as 4' x 3' but I believe that it can grow much larger than this, in the right conditions. It has a strong Damask fragrance. It has been used in various breeding programmes over the years, and is a parent of the well known 'Gertrude Jekyll'. This is 'Mme Alfred Carriere', planted to exactly the same level as she was planted at before. I decided not to water afterwards, as all the plants had soaked for 48 hours, and the soil was very moist anyway. She will soon outgrow the obelisk she is planted next to, and when this happens, she can romp through a nearby Aucuba. 'Mme Alfred Carriere' was bred in 1879 by Joseph Schwartz, and is a white Noisette rose, with hints of pink. It is a repeat flowerer, with a large first flush, and sporadic smaller flushes throughout the rest of the summer. Again, it is said to be hardy and disease-resistant. It is a strong climber, reaching about 20' and can take a degree of shade, so can be grown on a north wall. The third of my old roses is 'Mme Isaac Periere', a large flowered, deep pink Bourbon rose, bred by Garcon, in 1881. It produces masses of well scented flowers in June and again in Autumn. It grows to be a large shrub or short climber. 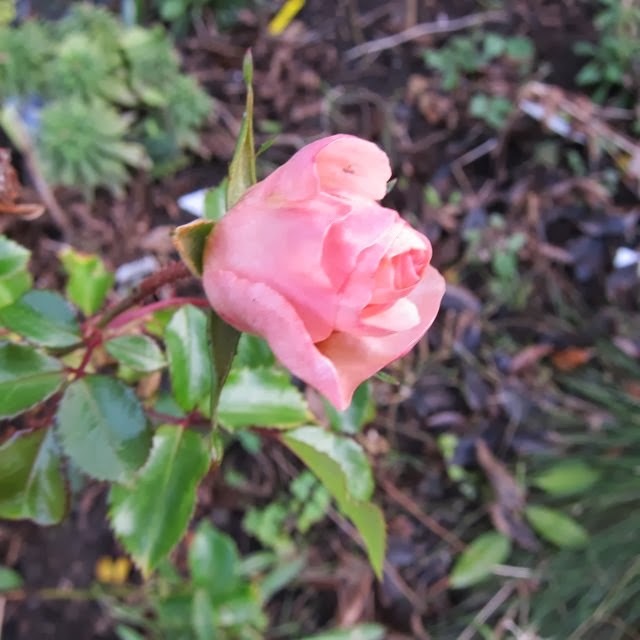 Just to lift the spirits, I saw and photographed this brave bud of 'Joi de Vivre' battling the January cold, near to where my new girls are planted. Hi Jane - great to see you out and about in the garden. I am grounded - too much rain and wind for me. Still I get to visit your garden and that's always inspiring! I see people taking cuttings and putting them in potatoes on pinterest. Have you ever tried this? 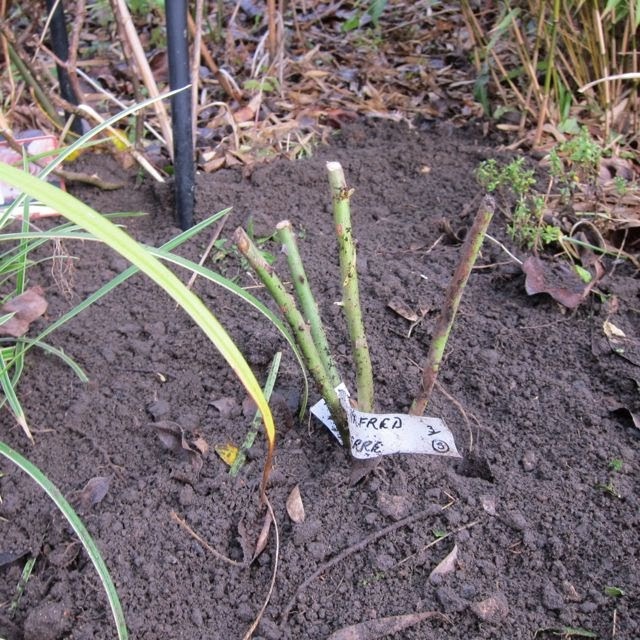 Or have you ever tried growing roses from cuttings? Hi Grace. Happy New Year to you! I have seen the rose cutting/ potato thing on various garden websites but have never tried it. I have, however, taken LOADS of cuttings the 'usual' way and have an approx 75% hit rate. Sooo easy! 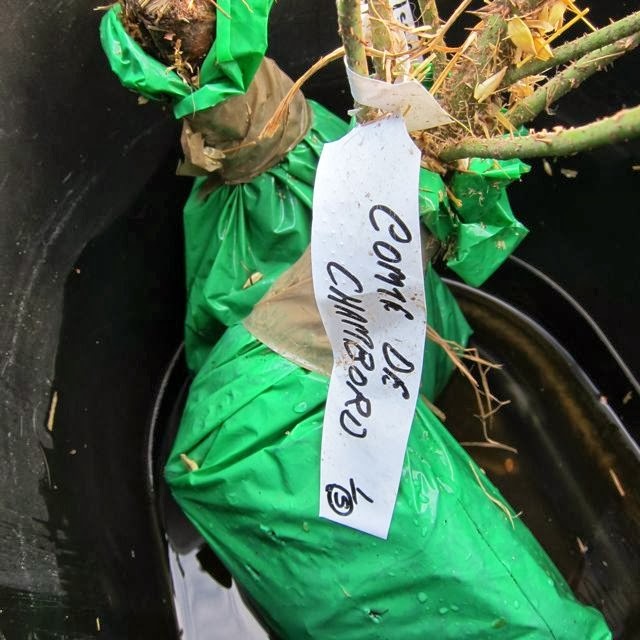 I always shied away from rose cuttings thinking that the graft was somehow important, but it turns out that the graft is for the grower, rather than the rose, and they do just fine on their own rootstock ! Roses are so expensive, so taking cuttings can save an awful lot of money. I wish I could get out too, the ground is still like a quagmire here. I hope the roses establish well, you've chosen some lovely ones. I had thought about putting Mme Alfred Carriere against a vertical bank behind our house, it's probably the only one that will cope with the shade. Hi Rusty Duck. Everything I read about Mme Alfred Carriere suggests that it would do really well in shade. I have planted mine in full sun, facing south, which is probably a waste of a prime planting spot ! hope your quagmire dries up soon and allows you to get out and garden ! It sounds as if you had a wonderful day out in the garden. I can't wait to see those Roses settling in and blooming magnificently. Hi Bernie... oh I do hope you are right ! Watch this space ! Will you do me a favor please, I had a really hard time finding a dedicated link on your G+ profile to your blog. When you leave me a comment, it goes back to your G+ profile, but I'm not always sure which link to click on to get to your blog. And like everyone, I'm pressed for time, so I can't be clicking away on all the posts hoping that one of them is yours, if you could put a link on the profile, I'm sure all of the bloggers that read your blog would love it. Hi Jen, thanks for the heads up about my G+ profile. The blog link was visible only to me, when I checked my settings !! Now public!! I hadn't realised ! Lucky you being able to plant. It's rather boggy here at the moment. It is good to get outdoors at this time of the year. I'll be looking forward to seeing how your roses do as the summer comes. Hi Angie, I must admit I was really surprised at how workable the soil actually was. I hough it would be much more waterlogged. Must make the most of it ... What is your soil like ? Is it clay based ? Happy New Year! I envy you being able to plant already. Here we will be covered in snow for at least another couple of months. 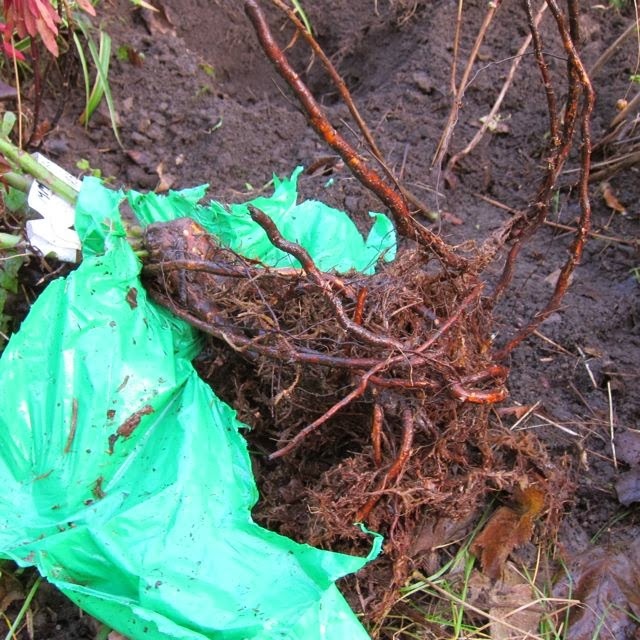 I hope to order a few bare root roses this spring as well. (I love the old varieties like the ones you have chosen especially if they are fragrant. It is hard to beat old roses for the fragrance.) I look forward to seeing how the ones you have planted develop and bloom. Happy gardening! Hi jennifer, yes, I felt lucky to be able to plant them , as the soil was moist but not too wet. Bet you are having a great time choosing your bare roots. Let me know which ones you go for. I am looking out for Louise Odier at the moment. 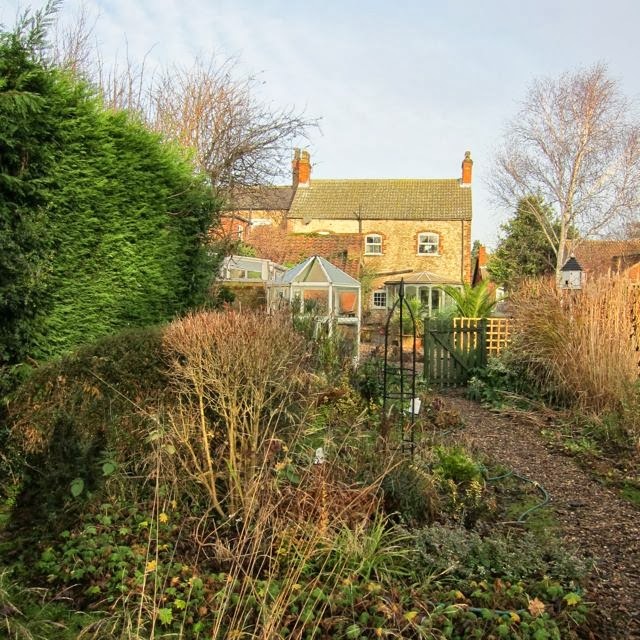 It is a wonderful feeling starting the year with some new gardening projects. The rain appears to have stopped for a while here, so I'm looking forward to getting outside this weekend, too (hopefully any frosts won't be too hard). I love your choice of roses, they will look beautiful. Hi Wendy, thankyou for dropping by! I love to have a new project to think about - what are you planning ? Hope you manage to get out there and enjoy! Where you dug the hole for the rose the soil looked very dry compared to our clay soil even though we haven't had all that much rain. Hi Sue, the soil was much less wet than I expected ... it was a pleasant surprise. Clay soil is hard work, but plants seem to love it when they get established. Hi Marguerite. 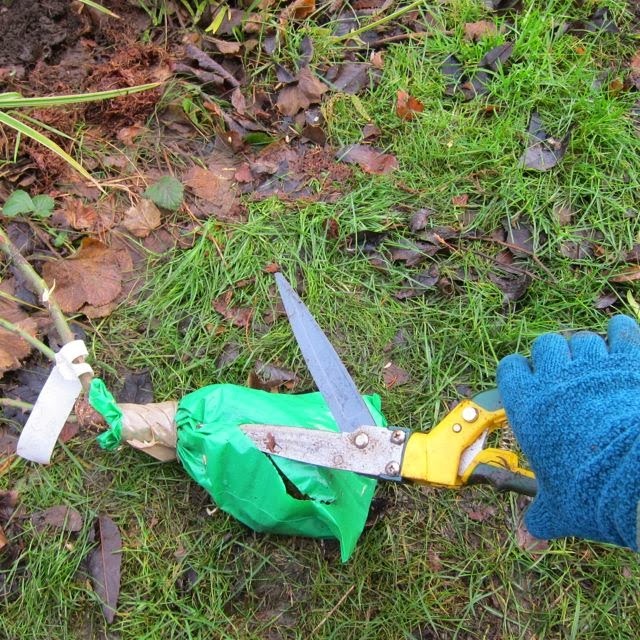 Ah, now, an old garden cane would be my tool of choice for opening a plastic bag, like a compost bag! It takes considerably longer than a shovel as you first have to stab a little hole in the bag, then slowly work it bigger, until you can get your hand in and rip it open ! !